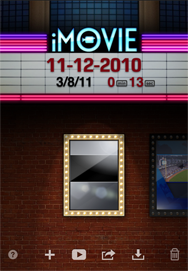 When Apple first premiered iMovie for iPhone last summer with the release of the iPhone 4, I was intrigued—but ultimately disappointed. While the app provided basic tools for editing and sharing, it lacked many key features: You couldn't even split a clip in two, for example, and the iPhone’s screen real estate made it nigh-impossible to accurately cut and put together any project over a certain length. 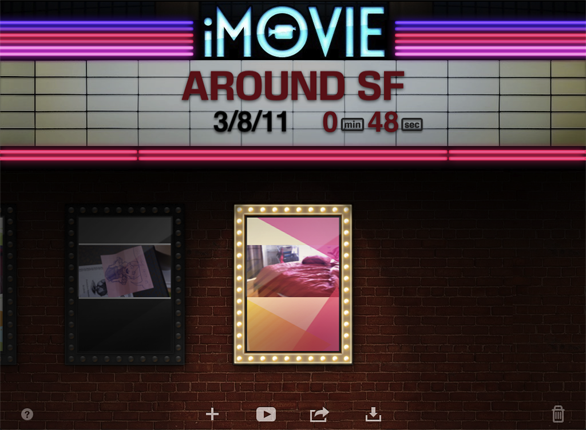 With this update, however, iMovie has taken a monumental step forward. The app has been redesigned, augmented with increased functionality, and universalized with support for the new iPad 2. While it still has some distance to go before it achieves feature parity with its desktop cousin, it’s become a legitimately worthy tool for editing on the go. I spent a few hours poking and prodding iMovie, and here’s what I’ve found. While iMovie for iOS has undergone numerous changes for this update, the most prominent has to be the addition of support for the iPad (though, unfortunately, only the device’s second generation). The extra screen real estate alone transforms the mobile editing experience, turning a somewhat cramped interface into a comfortable working environment. As a result, the iPad 2 has exclusive access to two new features carried over from iMovie ’11: waveform view and the precision editor. Additionally, the app’s new multitouch gestures—which work on all compatible iOS devices—provide a variety of new ways to work with clips and the timeline. You can zoom in or out or jump through the timeline; move, split, skim, and rotate clips; and open the precision editor (on the iPad 2) for more specific tweaks. Sound editing, too, has been overhauled. The app now allows you to layer up to three tracks of simultaneous audio and an optional background track over the clip audio (up from the previous version’s single non-adjustable track). Audio clips can be dragged and dropped throughout the timeline at will, though you can’t specify which track you’d like to drop your audio into—a bit annoying, for those who like to keep their sound effects separate from their music clips. Audio clips are controlled by one master volume slider, and can't be split or ducked, though you can trim the clip as a whole on either side using the yellow edit handles. 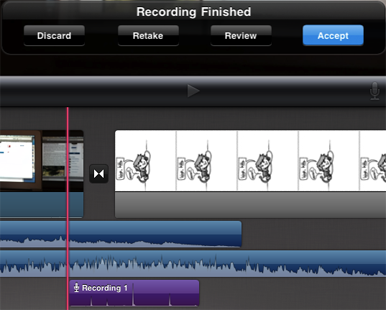 Unfortunately, the app still lacks a lot of iMovie ’11’s audio prowess. While you can view audio waveforms on the iPad, there’s no way to individually adjust or split audio clips; you’re stuck with a master volume control for each clip and an on/off button. Neither can you separate audio from a clip—though you can switch off the audio entirely. Double-tapping a clip will bring up its settings. Here, you can add and change the title and location data, alter volume, or delete the clip entirely. In addition to everything else Apple has packed into the mobile version of iMovie, titles can now be overlaid on images as well as video. Double-tap on an image or video to bring up its clip settings, and tap Title Style to enter the title viewer. You’re given the option of having no title, or an Opening, Middle, or Ending title. If you choose Opening, Middle, or Ending, the default “title text here” will pop up in the viewer, surrounded by the theme’s title style. Double-tap the default text to bring up the keyboard to change it. When you first open the app, you’re greeted with a wonderfully 1970s-esque movie marquee—complete with flickering neon lights and their requisite sound effects—and a row of your movie projects (if any). The name, date, and run time of the currently selected project will pop up on the signboard with a poster of the movie’s first frame—surrounded by neon lights—hung below it. You can scroll through the posters by flicking a finger left or right; as you do so, the board will change to the name of the currently selected project. This opening screen is also where you can change your project’s name: Simply tap the name on the marquee to bring up the keyboard. iMovie's opening screen has icons for Help, starting a new project, playing your movie full-screen, sharing your video, importing a project from iTunes, and trashing a project. Along the bottom of the screen, you’ll find an array of buttons for controlling your project. On the far left, the Help button will access a pop-up menu detailing almost everything you could hope to learn about the app. This manual is just as detailed as those found in Apple’s desktop applications, and I imagine the section on gestures especially will be of great help to new iMovie users. If you don’t feel like reading it in detail, you can also search through the guide. The center buttons refer to the projects themselves. You can tap the plus button (+) to begin a new project, or the play button to show the currently selected project in full-screen (or stream it to a compatible AirPlay device). Tap the Share button, and you can send your video to your Camera Roll, YouTube, Facebook, Vimeo, and CNN iReport; or export a copy of the project so it can be accessed using File Sharing in iTunes. The final button allows you to import any project you’ve added from a different iOS device in iTunes to your current device. And in the bottom right, the Trash icon will allow you to destroy your project. It’s good to note that if you trash a project with video, images, or audio you’ve recorded directly into the app, those files won’t be saved to the device unless you save them beforehand (more on that later). To enter the editing viewer, you can either tap the new project button, or tap one of the posters to enter a project-in-progress. On the iPad in landscape view, the editing viewer is broken up into three panes: browser, viewer, and timeline. On the iPhone (or when using the iPad in portrait mode), you’ll only see the viewer and timeline, with the browser overlaid in a pop-up menu. In landscape mode on an iPad, the editor is divided up into three panes: the browser, viewer, and timeline. The browser contains all your accessible video, photos, and audio. Any video you’ve taken on your device, stored in the Photos app, or imported using Apple’s Camera Connection Kit should be easily accessible here, labeled by date and length. Unfortunately, there seems to be no easy way to import video from third-party apps—you’ll need to find some way to get it into the Camera Roll first. A note on importing video through the Camera Connection Kit: While bringing in iPhone or iPod touch video is easy enough, the clip format used by other cameras may not be compatible with iMovie. Trim your clip to your liking before dropping it into a project by dragging the yellow edit handles left or right. You can skim through a video by tapping and, while holding your finger down, scrolling left or right. If you tap a clip once, a yellow box will appear around it (with an editing handle on either side) along with a blue downwards arrow button. You can use the editing handles to trim the clip to your liking before sending it to the timeline; when it’s cut to your satisfaction, tap the blue arrow to bring the video down. Bringing in photo or audio material is somewhat simpler: Just find the image or sound clip you’d like to import, and tap its thumbnail or title. If you’ve already added anything to the timeline, your new material will drop down wherever the red vertical playhead sits. If your playhead is in the middle of a clip, the new image will be inserted at the end, rather than auto-splitting the video. In addition, you can’t add an audio file without first adding an image or video clip. The viewer, which allows you to preview your film-in-progress, is contained by two toolbars along the top and bottom. Along the top toolbar are three buttons: My Projects, which returns you to marquee view; Undo, which lets you undo any action you've made since opening iMovie; and Settings, which lets you tweak information within an individual project. In Project Settings, you can choose from one of eight themes—Modern, Bright, Playful, Neon, Travel, Simple, News, or CNN iReport—as well as toggle the theme music, background music loop, and fade in/outs for the project on or off. Unfortunately, there’s still no way to avoid choosing a theme, but you can opt-out of its sections—theme music, or title and transition style—by adjusting those settings individually. Your recorded voiceover drops into the timeline at the playhead. Along the bottom of the viewer, you can toggle audio waveforms on or off (iPad only), play the movie starting at the playhead, or record audio or video. If you tap the Audio icon, you’ll be prompted with a pop-up menu that shows your levels and a Record button; tap that, and the app will count down from three and record into the timeline from the playhead onto a new track. The video track will play concurrently with your recording, to help with Voiceover timing and the like. When you’re finished, tap Stop, and the pop-up will morph into four buttons: Discard, Retake, Review, or Accept. Video recording, meanwhile, works much like the Camera app. Take a photo or video clip, and when you’re finished, you’ll be prompted to retake it, or use it. Like audio recording, your video clip will pop into your timeline at the playhead. As I mentioned earlier, videos and photos taken in the app aren’t automatically saved to your Camera Roll—to do so, you’ll need to go into the Video browser and tap the Edit button, then tap the blue folder icon to copy the video. Otherwise, if you delete your project, any recorded video will go away with it. In your browser, while in edit mode, tap the blue folder to permanently save your recently recorded video. Along the bottom of your screen, you’ll find your project timeline. To my delight (and I’m sure, that of many others), the timeline here resembles the traditional single-row timeline found in most major editing applications—no iMovie ’08 and ’09 multi-row craziness here—and is easy to skim back and forth with a single finger. Like iMovie’s first iPhone iteration, the playhead stays stalwart in the center of the timeline while you scroll your project through it. 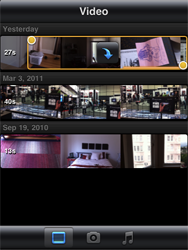 You can also zoom in or out along the timeline by two-finger pinching. Once you’ve dropped in a few video files or images, cutting them together is surprisingly simple. My initial biggest complaint with iMovie for iPhone—being unable to split clips—was taken care of in version 1.1 with a single (literal) swipe, and on the iPad, the larger timeline makes this gesture even easier. Splitting a video is as simple as positioning the playhead where you’d like to cut, tapping the clip in question to highlight it, and swiping down on the playhead. However, I still found this gesture to be a bit persnickety if not done slowly and on the playhead itself; if you go too fast or swipe elsewhere, you’ll end up deselecting the clip. That said, once you get the hang of it, you’ll be cutting clips with ease in no time. Highlight the clip and swipe down on the playhead to split it in two. 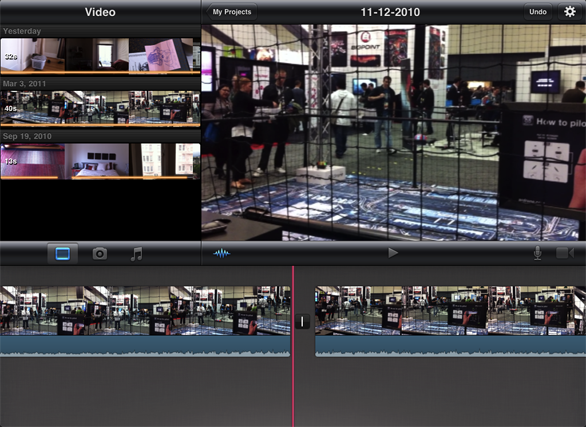 After you split a clip, a vertical line encased in a transition box will appear between the two new clips. 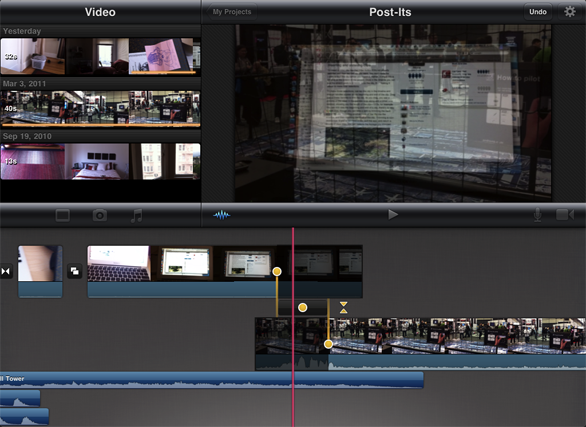 While the desktop version of iMovie allows clips to sit next to each other with nothing in-between, every clip in your mobile iMovie timeline is automatically separated by one of three boxes: the aforementioned vertical line, which serves as the app’s default “no transition” link; two triangles for a cross dissolve; or two overlapping squares for the default theme transition. Double-tap a transition box to choose your style and duration. The reason for these little boxes is two-fold: First, it eliminates the need for manually placing transitions. Instead, if you’d like to add or change a transition, you need only double-tap the box; a pop-up menu will appear, allowing you to alter duration and style. Second—and perhaps more important—if you’re on an iPad and you pinch open the box, you’ll open the Precision Editor. By itself, the addition of this tool transforms iMovie from “fun toy” to “legitimately useful editing device.” Not happy with the trim you made when you first brought your clip from the video viewer to the timeline? In the Precision Editor, you can finely adjust these trims down to individual frames—all with a drag of your finger. The iPad 2 has arrived, and Macworld's got a full hands-on review of the product from Jason Snell.